GENEVA – The United Nations Special Rapporteur on the situation of human rights in Myanmar, Tomás Ojea Quintana, will undertake a mission to Myanmar, from 31 January to 5 February, at the invitation of the Government. During his six-day visit, the independent expert, designated by the UN Human Rights Council to monitor and report on the situation in Myanmar, will meet with Government ministers, members of Parliament, the recently-established National Human Rights Commission and various other relevant stakeholders. On 5 February, at the end of his mission, Mr. Ojea Quintana will present preliminary observations at a press conference in Yangon, with further details to follow. His full report on the visit will be presented to the upcoming 19th session of the Human Rights Council. 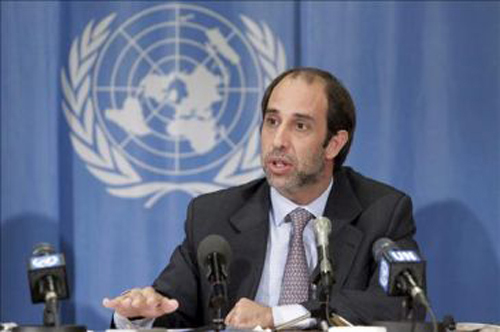 Mr. Tomás Ojea Quintana (Argentina) was appointed by the United Nations Human Rights Council in May 2008. As Special Rapporteur, he is independent from any government or organization and serves in his individual capacity. For press inquiries and additional information, please contact Mr. Aye Win (+95-9-5123952/ email: aye.win@undp.org)or Ms. Maureen Teo (Tel: +41 22 928 9113/ email: mteo@ohchr.org) or write to sr-myanmar@ohchr.org.